1. Create a study plan. Split up your total weekly study time according to how much time you to need to devote to each subject. Draw up a weekly schedule. Find out when large projects are going to come due and include extra time for them in the calendar. This will make it easy for you to decide when to start working on each project. 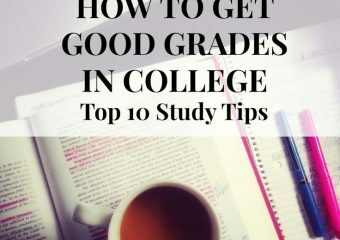 College Grades are very often based on timely homework hand-ins. Keep up with your assignments and turn them in on time. Ask your teachers for suggestions to help you learn more and improve your work in areas where you are weak. You may also ask your classmates if meeting with your lecturers seems difficult – which it shouldn’t be. Getting a bad grade can help you figure out where you went wrong and to avoid making the same mistake again. This will allow you to do better in the future. If you seem unable to keep up with a particular subject, get help from a tutor to catch up. This could be a classmate, a senior, or someone appointed by the school. Some schools also have assistance available on campus through places such as writing centers. Getting over inertia and actually beginning your study or homework can be tough. Create or join a study circle. Meet friends and do your work together. 7. Attend All Your Classes. It allows you to absorb classroom material just by sitting in the classroom, and following and participating in the lectures and discussions. It allows you to make your presence noticeable and can help you to form a mentoring relationship with your lecturers. Lecturers often have bonus participation points that are awarded to students who are active in class discussions. It allows you to earn attendance points and can directly impact your grade. Understand the expectations of your professors. Learn the class syllabus handed out during the first week and stick to the deadlines and the requirements. Communicate with the professors if you are struggling and unable to keep up. The professor may not be aware of your difficulty, so meet the professor away from class and ask for the help you need. Use the system once you set it up. Keep all papers like homework, tests, and class papers accessible. Don’t throw out old homework or tests; you may need them to study for future tests. Tackle the harder work first so that you have enough time to complete it. Take enough breaks. You can try rewarding yourself by taking a break for completing a large or difficult task. Break more difficult or complicated projects into smaller, more manageable pieces, assigning deadlines to each part. Do not overextend. Don’t get involved in more clubs and organizations than you can manage. Above all, concentrate and study early and often. If you need help, feel free to ask your professors or the school.